From orientation to graduation, the official UF Bookstore has what every student needs -- Used books that save you up to 25%, academic-priced software saving you up to 75%, school supplies, backpacks, Gator Gear, and more. We make campus life easier and bring students the MOST used books for their money. But UF Bookstore is more than textbooks. Whether in need of a new notebook, greeting card, Gator shirt, or a snack, we're conveniently located in the middle of campus steps away from class. We carry all required textbooks as well as customized course packs. Qualified students may also use the Textbook Deferred Payment Program to pay for their books. Textbook rental program now available at the UF Bookstores, both in store and online. Go to www.rent-a-text.com and sign up to begin saving 50% on the initial cost of new textbooks. 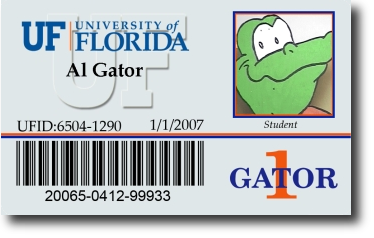 You can use your Gator 1 card using deferment or a Bookstore debit card to pay for the rental. In addition to saving at least 50% on the initial cost of many textbooks, students can highlight and make notes in their rental textbooks, and have the option to purchase the book at the end of the term (for an additional fee). Students can rent, pickup and return textbooks either in store or online. As a student you may also Advance Order your books. This is done in 2 easy steps. Click on the term that you want to view at 'My Textbooks' by logging on to Student Self Service at ONE.UF. Then go to "ADVANCE ORDER YOUR TEXTBOOKS FROM THE UF BOOKSTORE!" Note: The Textbook Deferred Payment Program is also available for students who Advance Order books. For information on textbook requirements for any course visit http://www.bsd.ufl.edu/textbooks. When you need to sell your textbooks, use the UF Book Market at www.bsd.ufl.edu/BookMarket and receive Buyback Alerts from the UF Bookstores where you can receive 50% of your original purchase price. You can also list them to sell to other students. The more used books we recycle on our campus, the less of an environmental footprint we make. If you can't make it to the store, you can log on to www.ufl.bkstr.com to shop for textbooks, Gator clothing and gifts 24 hours a day, 7 days a week. For more information call the Bookstore at (800) 226-3015 or locally at (352) 392-0194 or FAX 392-3660, or e-mail us at ufbookstore@bsd.ufl.edu. This page was last updated on 1/7/2019.